Structured cabling is the basic foundation on which all other network equipment depends. Now more than ever before, critical business communications, operations, and processes depend on effective transport over a structured network and cable infrastructure. State Systems adheres to strict industry specifications in the design and installation of structured cabling for all applications. You can trust State Systems to implement a structured cabling system with extensive testing to ensure maximum performance when plugging in your network equipment. Infrastructure that is poorly designed, installed or maintained can hinder productivity and business operation. Our certified technicians offer design, installation, maintenance, and optimization of structured cabling systems comprised of copper cable, fiber optic cable, and coaxial cable for delivery of voice, data, and video services. Cable infrastructure has the longest lifecycle and lowest cost of any network components. Ensure your structured cabling system is done the right way with State Systems. Shielded and unshielded low voltage cabling copper solutions provide the ultimate performance and reliability for today and tomorrow’s copper infrastructure requirements. Our Cat 5e, Cat 6, Cat 6a, Cat 6e, and proposed Cat 7 solutions are designed to “future proof” your environment to the greatest extent possible. We also offer low voltage cabling fiber optics in single mode, multi-mode, and laser optimized varieties that complement the deployment of optical solutions deeper into the network, delivering future-proof infrastructure. Our fiber optic services include design, engineering, installation, termination, and testing. Coaxial cabling is a low voltage cabling solution designed to support a variety of media applications for video and other advanced copper applications that typically require adherence to strict performance criteria. We can design and install solutions that include music/sound/paging systems and public address (PA) systems, as well as nurse call systems, CCTV and security systems, fire alarms, and access control systems. For your cabling system to operate hassle free and at full efficiency, it is important the cabling for the network be installed by structured cabling professionals, such as those at State Systems. Prior to allowing anyone to work on your cabling system, you should ask yourself the following questions. Have you received a fair and detailed quote and price? Can the structured cabling system provider design a cable infrastructure which will meet all current and future system needs? Will the cable be installed to meet all standards and certifications, such as BICI, EIA/TIA, ANSI, NECE and all state and local building codes? Will the installer ensure you are provided with accurate test results which demonstrate that the system meets category standards? Can your installer test and diagnose any possible future problems with either your cabling or hardware? Can the cable installation company correctly terminate the cable fibers, which can become increasingly complex and important as greater bandwidth is added to your computer system? Can your installer provide you with low voltage cabling solutions? State Systems can assure you that all of these questions and needs will be taken care of by our structured cabling system experts. State Systems knows that being able to manage your structured cabling infrastructure is another important aspect of your structured cabling needs. It is natural to have adds, moves and changes to the cabling system to support employees as they are restructured or added to the ever-growing office environment. This day-to-day management requires in-depth knowledge of how devices are connected and where they are located, and State Systems technicians are certified and well acquainted with the telecommunication standards that define how a cabling system should be labeled and documented. 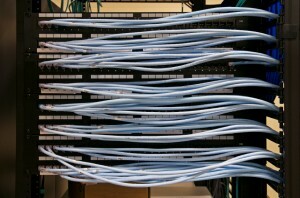 For more information about our structured cabling services, please call us today or contact us!